One of my kids’ favorite things in the world is the sensory tub. I have so much fun creating them and they have so much fun playing in them and making a huge mess! Like a lot of homeschoolers, September is apple month around here. I’ll have a post later in the week about how we are incorporating apples into our every day. Since we are “studying” apples, I just knew I had to make an apple themed sensory bin. As you can see, the kids were so excited that I didn’t even get to snap a picture before they dug right into it! 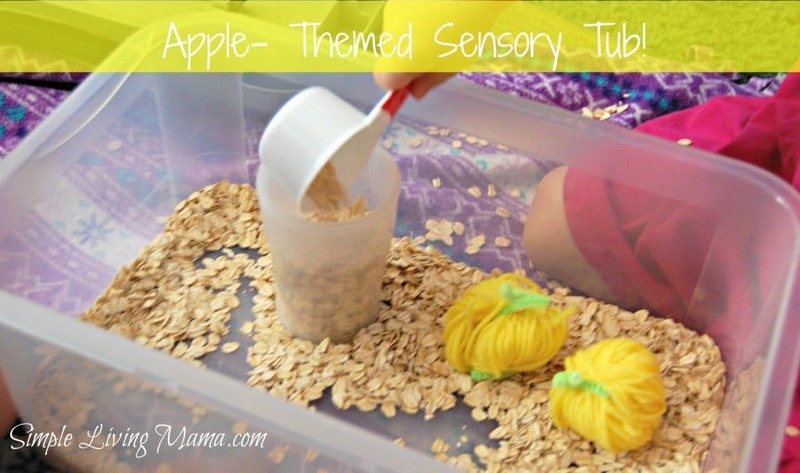 I got part of the idea for my apple-themed sensory tub from I Can Teach My Child’s tub. I filled the bottom of the our tub with oatmeal. I wanted to put some number flash cards in the tub for Bug, but my printer was out of ink. So, I made my own apple flashcards by hand! It was really pretty simple. I just used a sheet of paper and divided it into 10 boxes. 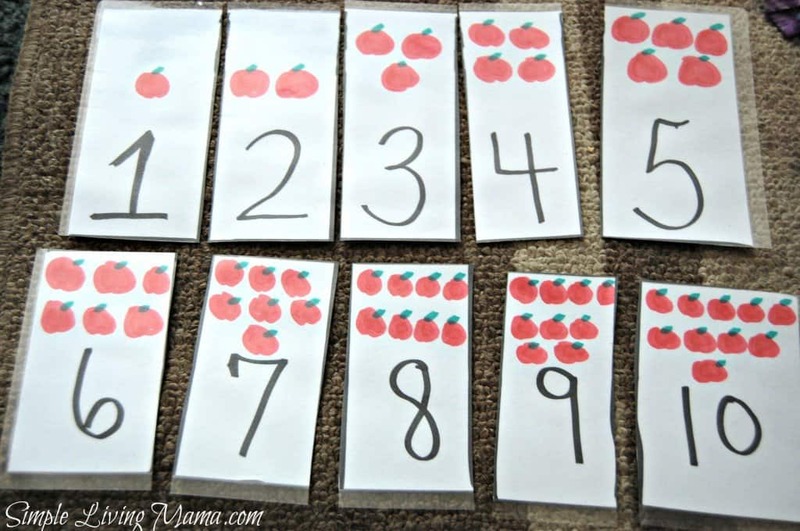 Each box has a number with the corresponding number of apples in it. Then, I laminated the sheet and cut out the cards. 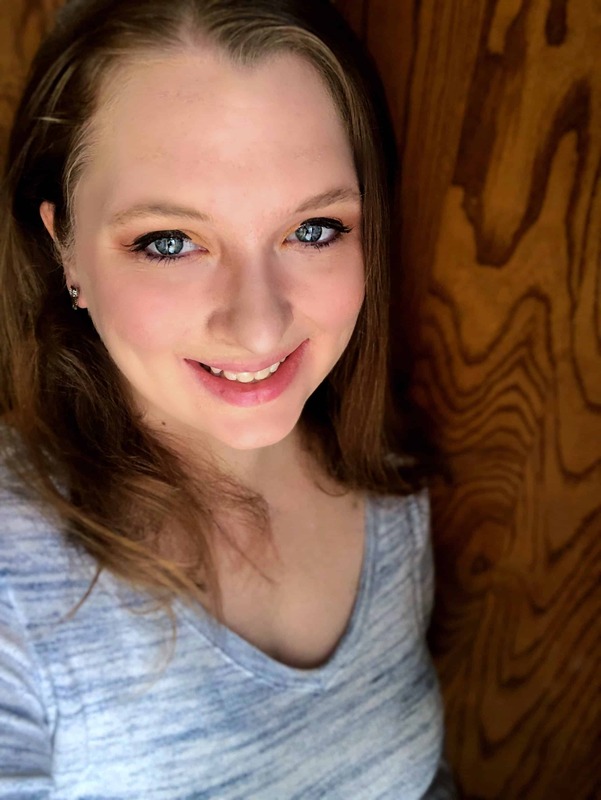 It’s not perfect (or perfectly straight), but it was easy! I wanted to put some small apples into the bin, but I didn’t have any on hand. 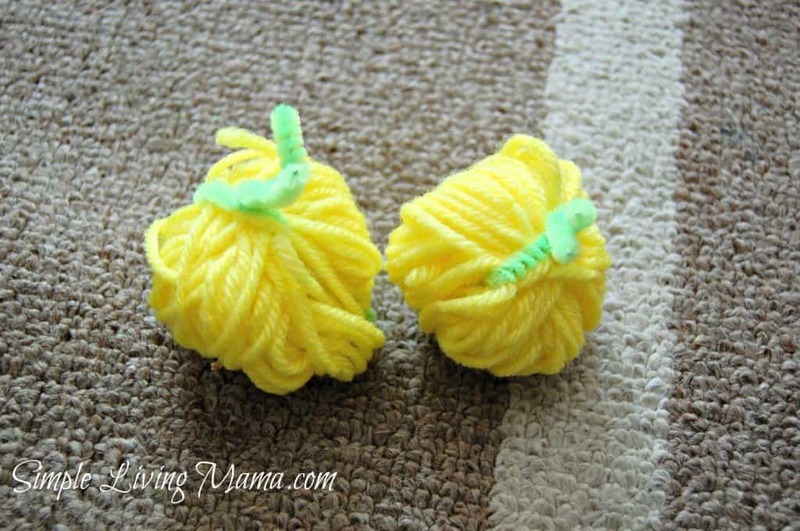 I loved these Little Apple Yarn favors, so I attempted to make a couple. Well, I had to use supplies I had on hand, and Bug and Mr. Simple thought I made pumpkins instead of Golden Delicious apples. Oops! If you use red yarn, they probably look more like apples! So along with my oatmeal, flash cards, and yellow pumpkins, I mean apples, I added some acorns that are not pictured, We have a ton of acorns around the yard, so I just gathered some up for the kids to play with them. Throw in some cups and scoops and you’re all set. Don’t you just love Sis’s hair do? She’s a hoot! This sensory tub kept my kids occupied for up to an hour at a time. I would pull it out more often, but the oatmeal is terribly messy and really cannot be picked up and put back in the tub very easily because it kind of crumbles up. The vacuum got a good workout, that’s for sure! I’m excited to create even more sensory tubs for my kids. They really are a ton of fun! 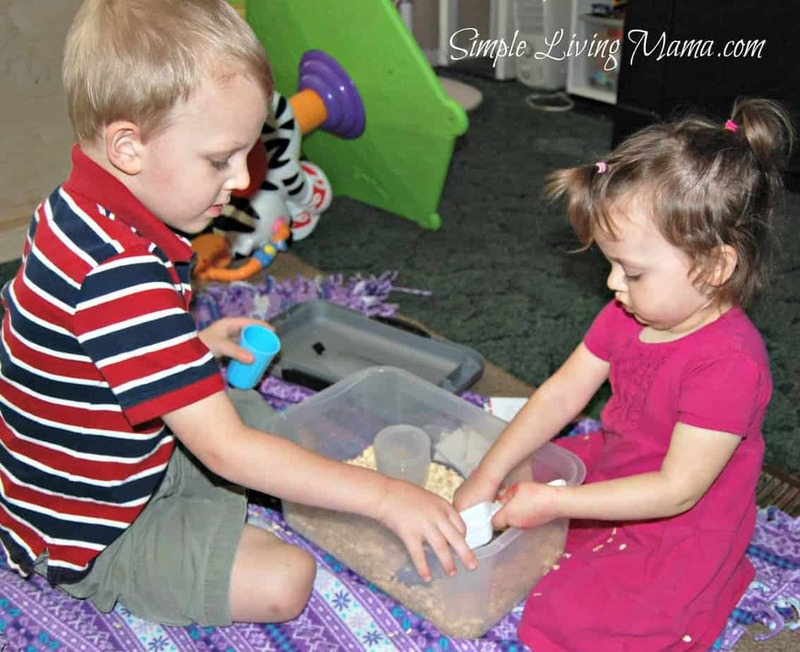 Do you make sensory tubs for your kids? Thanks, Nikki! Sensory tubs are so much fun! This post inspired me to do this with my daughter! Granted, all I had were the oats, but she LOVED it. 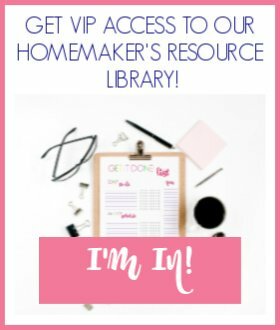 Thanks for sharing this with the Thrive @ Home link up!